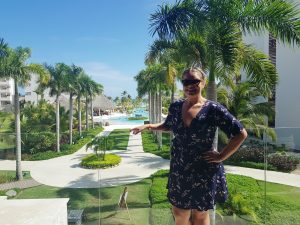 “In November I was lucky enough to join the Dominican Republic Tourist board on a trip to visit the island. 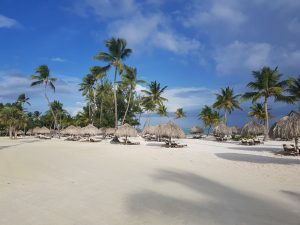 Direct flights operate from both Manchester & London Gatwick to the Dominican Republic to its various airports, on my trip we flew with British Airways out of Gatwick into the easterly (and some would say main) airport on the Island of Punta Cana. 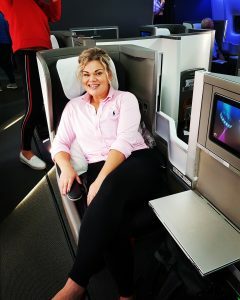 We were also fortunate enough to be given the opportunity to fly Business Class with BA which was a real treat and wonderful start and finish to the stay. 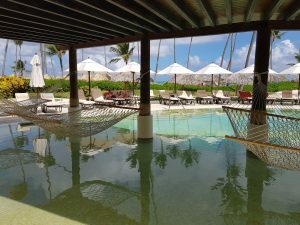 Punta Cana is one of the largest resort areas on the island and boasts a range of different hotels from 3* – 5* All Inclusive properties, to exclusive private villa resorts, to adults only resorts etc. There is a hotel for everyone whether it be families, friends, honeymooners or multi-generational trips covering lots of different ages – there will be a holiday to suit everybody’s needs. The majority of the hotels are larger All Inclusive properties and most lie beachfront and offer all the modern amenities & restaurant choices anyone could ask for in a holiday of this type. 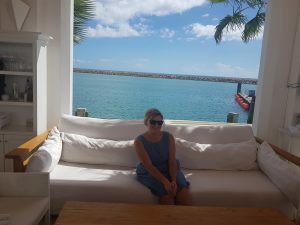 I visited over 15 different hotels on my trip and stayed in 5 different properties so I feel I got a good overview of what the Island can offer for different people. 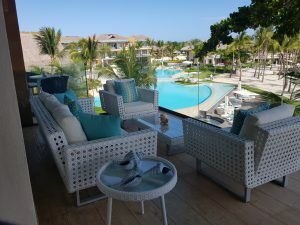 My favourite hotel I stayed in was the exclusive Casa de Campo resort which boasting its own Marina, Beach club, golf course, equestrian centre (I could go on) and could almost be described as its own private town! Speaking of the golf if you are an avid golfer the course’s at Casa de Campo have been voted the best courses in the Caribbean and host worldwide golf events on a regular basis. Every guest staying there whether in a hotel room or in one of its many private villas receives their own golf buggy which they use to transport themselves around the vast resort (a lot of fun in itself!). Having famous celebrity guests like Jay Z, Beyonce & Justin Beiber to name just a few this really is one of the places to be seen on the island. 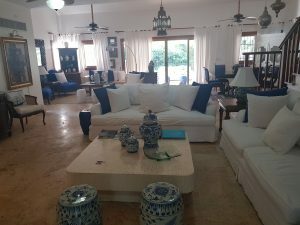 We were lucky enough to be given a private 5 bedroom villa to stay in with its own pool and with this you also receive your own butler and maid who will take care of you in villa throughout the day – it really is an experience I will never forget! One of the highlights of the stay was a boat trip we took to the pretty Catalina Island. Beautiful beach and crystal blue sea – it’s a little haven for a few hours of rest, relaxation and fun in the sea. We were also taken to the capitol of the island Santo Domingo to show us a different side of the country. 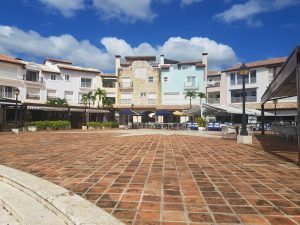 The old squares & historic buildings give the capitol an abundance of character and a Spanish / Cuban flare is apparent and the area is called a mini Havana by some people. We had a tour of the old city followed by a brilliant evening watching Bonye which is traditional Dominican dancing. The day was then finished with a meal in the historic Plaza de Espana Square which is a definite recommendation of a lovely place to sit for a drink or have a meal through the day or evening time. 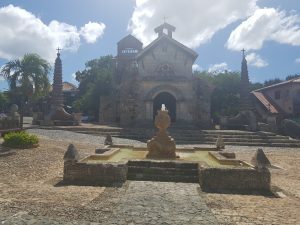 With influences from Spanish, Portuguese & South American settlers along with Caribbean islands as well the Dominican Republic is a diverse melting pot of people and cultures which gives it lots of interesting history. 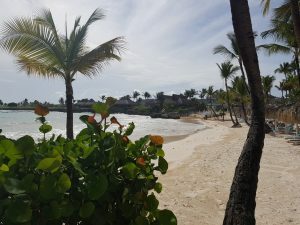 It has a different feel to other Caribbean islands I have been to and the warm welcome & service from everyone we met makes was a real treat. If you need any help in planning a trip please do not hesitate in contacting me further via email on hollie@spa-travel.com or phoning the office on 01937 845678. ← 2020 on sale – book now to save & secure a cabin on the trip you won’t forget in a hurry! Error: Error validating access token: Session has expired on Monday, 01-Apr-19 06:23:33 PDT. 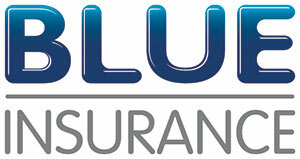 The current time is Thursday, 25-Apr-19 23:20:58 PDT.